Does Non Celiac Gluten Sensitivity Exist? Thank you to Dr. Peter Osborne from The Gluten Free Society for allowing us to reproduce his article on non-celiac gluten sensitivity. This is one of best articles I have ever had the pleasure of reading on this subject. Please be sure to visit Dr. Obsorne’s website, The Gluten Free Society. Over the last year, there has been major debate about whether or not non celiac gluten sensitivity (NCGS) exists. Now I know what many of you are already thinking…OF COURSE IT DOES! Just ask anyone without celiac disease who has had a dramatic change in health as a result of going gluten free. I have personally seen more than 5,000 patients over the last 15 years. Many of them had previously tested negative for celiac disease and were told by their doctors to continue eating grain. The mass confusion on this issue has two origins. Flawed Diagnostic Lab Testing. Blood tests are aimed at identifying celiac disease. These blood tests are non comprehensive, non specific, and have a tendency to come back falsely negative. The truth is, even though there are over 400 different forms of gluten that have been identified, the blood tests only measure for the autoimmune reaction found in celiac disease, or a select few antibodies against a handful of gluten proteins found in wheat, barley, and rye. Even the most progressive labs like Cyrex only measure for a handful of different forms of gluten. The test that most GI doctors use as a gold standard (The Biopsy) is more often negative than positive. The reasons? Most people do not develop the classic villous atrophy of the small intestine associated with celiac disease. They have tissue damage in other areas of the body including the brain, liver, skin, muslces, and thyroid gland. Remember that a biopsy is an investigation of the small intestine that includes microscopic samples only. The actual surface area of the small intestine is roughly the size of a tennis court. Taking microscopic cross sections is hardly a comprehensive or definitive evaluation. In my personal experience, I have see as many as 9 negative biopsies in a row( over the course of many years) in the same patient before a 10th biopsy revealed a positive result. Were the first nine biopsy evaluations wrong or did the damage take years to manifest before a biopsy could reveal it? Under Educated Physicians: It is no mystery that gluten sensitivity is a nutritional problem. When you combine that fact with the sad reality that the average GI doctor receives less than 7 hours of nutritional study throughout medical school, it is not hard to understand why so many doctors casually dismiss gluten as a potential health threat. Add to this the fact that research in this area has exploded over the last decade. It is a challenge even for the most dedicated doctor to stay abreast of all of the new findings in this area. Unfortunately, the overwhelming majority of doctors are in gluten denial. Even though the existence of non celiac gluten sensitivity has already been proven in other research, I feel like it is important to highlight the fact that other research groups continue to confirm it. Another new study set out to identify whether of not gluten was a problem for those without diagnosed celiac disease. The study involved 61 adults who self reported that eating gluten caused them harm. This study was a randomized, double blind, placebo controlled trial. In case you weren’t aware, that means that this study meets the criteria for the highest scientific standard. What were the results? According to the per-protocol analysis of data from the patients who completed the trial, intake of gluten significantly increased overall symptoms compared with placebo (P=.034). Abdominal bloating (P=.040) and pain (P=.047), among the intestinal symptoms, and foggy mind (P=.019), depression (P=.020), and aphthous stomatitis (P=.025), among the extra-intestinal symptoms, were significantly more severe when subjects received gluten than placebo. One could argue that bloating, brain fog, and depression are very subjective symptoms. Mouth ulcers on the other hand are physiochemical symptoms that cannot be blamed on a psychosomatic response. Why All the Gluten Confusion? The biggest reason for all of the confusion has to do with a lack of knowledge. To date, there is no scientific consensus on the issue. If we break down what we do know, it might make more sense. Gluten is not a single entity. Gluten refers to a family of proteins. To date thousands of gluten proteins have been identified. Most recently a study identified 400 new forms of gluten that are more damaging than the form of gluten doctors most commonly test for. There is NO LAB that tests for all of the different forms of gluten. One of the other points of confusion relating to gluten has to do with the fact that the pathway for gluten induced damage is not simple. There are a number of different ways that gluten can induce damage. Some of the pathways can be measured and identified via lab tests, others can not be measured at all. One of the most common is through an allergic response. Classically, when people think of an allergy, they think of a acute reaction that leads to watery teary itchy eyes, shortness of breath, wheezing, coughing, hives on the skin, vomiting, or diarrhea. This type of allergy, also referred to as an IgE response occurs quickly – within three hours of ingestion or exposure. Think of this type of reaction as an immune system canon going off. Many experience a wheat allergy in this way. Keep in mind that a wheat allergy and a gluten sensitivity are not the same thing. A delayed hypersensitivity reaction (see the right side of the diagram below) is a more subdued type of response. Don’t think cannon, think bullet. People don’t typically manifest severe or obvious problems with this type of reaction. This type of immune response builds with time and exposure. In other words the more a person is exposed to over time, the bigger the inflammatory problem becomes. If you look at the diagram below, you can see all of the known immune pathways from both an acute and a delayed perspective. 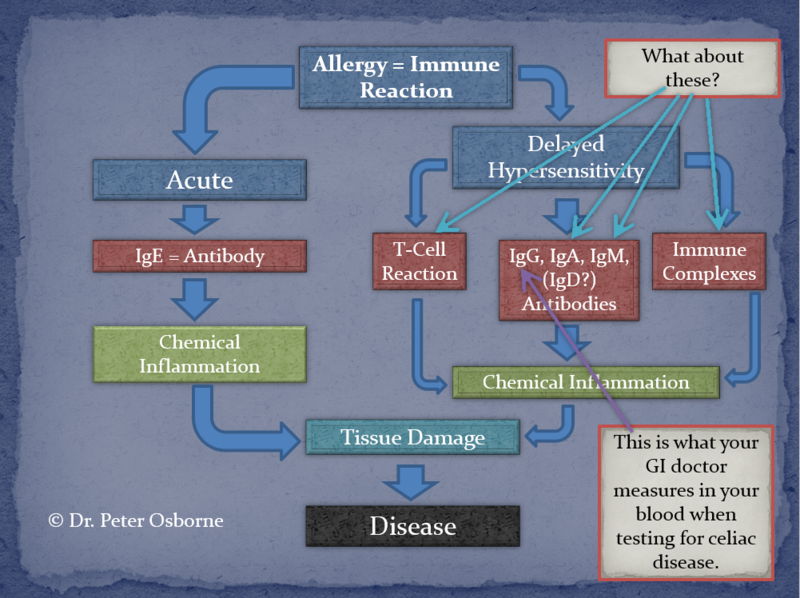 The IgE side of the diagram is typically what an allergy doctor will measure. When trying to identify celiac disease or gluten allergy, most labs only measure the IgG response to a handful of different types of gluten. This is precisely why so many tests come back negative even though a person may experience dramatic health improvements by cutting out gluten. There are a number of additional types of responses that rarely get discussed. Understanding some of them may be helpful for you to grasp the whole concept of gluten sensitivity better. Gluten Intolerance – not the same thing as a sensitivity, gluten intolerance refers to the inability to digest gluten. This in turn leads to the protein putrefying in the gut. The by product of putrefaction leads GI disruption in a number of ways to include the symptoms of IBS, stress on the enzyme producing cells of the intestine and pancreas, and changes in healthy GI bacteria. 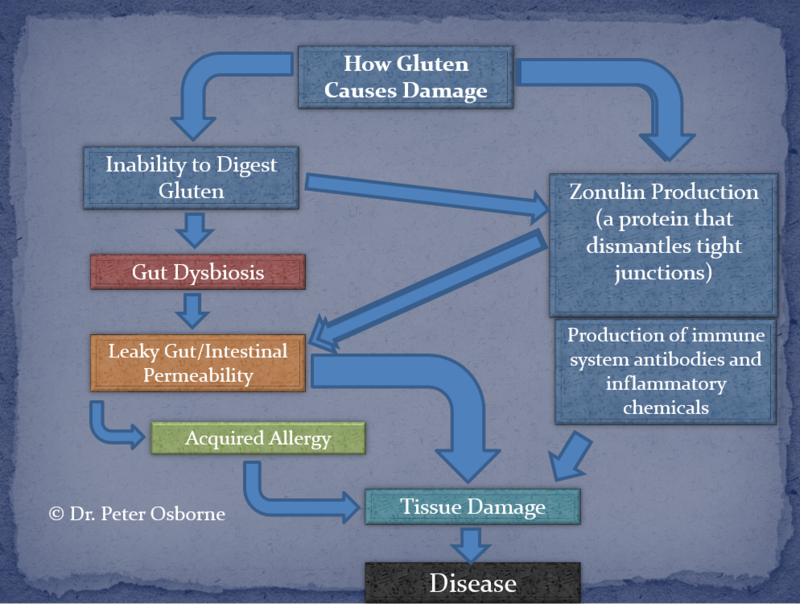 Gluten Induced Dysbiosis – gluten has been shown to alter the normal bacterial flora in the gut. This can lead to multiple types of digestive problems including leaky gut. Gluten Induced Leaky Gut – Dr. Alesio Fasano of Harvard discovered that gluten causes a direct intestinal permeability (leaky gut). This reaction is not an immune reaction. That is why the lab tests for celiac and gluten will never detect this. Remember that lab tests only measure antibody responses. Molecular Mimicry – This is what can happen after the gut becomes “Leaky”. The gut is responsible for handling all types of “undesirable characters” to include the viruses, bacteria, protozoans, prions, parasites, yeast, chemicals from food, chemicals in the water, etc. Some of the molecules that the gut helps to manage can mimic the tissues within our own bodies. When this happens, the molecular mimicry process leads to autoimmune diseases. For example, you may be exposed to a bacteria in your food. Your gut would typically handle this exposure without a problem, but because it is leaking, the bacterial proteins are able to access the blood stream. These bacterial proteins can mimic or look like the cartilage in your joints. If this happens, your immune system not only attacks the bacterial proteins, but it also starts to attack your cartilage. This in turn causes joint pain and inflammation. Gluten Induced Nutritional Loss – One of the biggest secondary effects of gluten is the loss of vitamins and minerals. This can occur as a result of GI damage and the subsequent inability to process, digest, and absorb nutrients, but it can also be as a result of excessive inflammation. Increased inflammation puts a greater demand on the body’s vitamin and mineral storage. Then we get to the non gluten aspects of grain that can also contribute to damage. These are the elements that are often confused as gluten sensitivity, and this is why some research shows that gluten proteins are not a problem. Lectins and other grain protective proteins – Remember what grains are – the seeds of grass…and like all seeds, they are designed to protect and allow for the perpetuation of their species. The seeds themselves are physically hard, hard to digest, but they also contain grain protective proteins that can cause inflammation and inhibit our ability to digest them. Examples of these non gluten proteins have been discovered over the last several years, but they are rarely discussed within the confines of gluten sensitivity. Some of these protein families include: Serpins, Purinins,and α-amylase/protease inhibitors. Chemicals Used in Food Processing – There are a number of chemicals used in food processing that can insight gluten like symptoms. One of the most common additives is MSG. Bromine is chemical commonly added to flour as a dough conditioner. It can enhance the detrimental effects of gluten. Another common enzyme process used for dairy manufacturing is microbial transglutaminase. This process creates a dairy product that can mimic gluten proteins. Carrageenan is another compound used to thicken foods. It has been shown to cause gluten like symptoms as well. Chemicals Used in Grain Production – The most notable is glyphosate – AKA Roundup. This chemical pesticide has been shown to cause many of the same symptoms as those seen in gluten sensitivity. Some believe that it is glyphosate, not gluten, that is responsible for many of the diseases we see gluten contribute to. I have personally not seen this with my patients. In my experience, those with gluten sensitivity who attempt to eat organic grain products continue to have reactions to the gluten. Grains are High in FODMAPS – these are difficult to digest carbohydrates that can contribute to gas, bloating, and irritable bowel symptoms. Wheat and corn sugars are especially high in them. Grains are High in Molds and Mycotoxins – Because of farming practices, grains contain large quantities of mold and the toxins mold produces. Some people have gluten like reactions to these compounds. Recent research has identified mycotoxin in corn to cause persistent problems in those trying to follow the gluten free diet. Medications & Other Foods Known to Mimic Gluten Sensitivity – Research from Mayo has identified that certain blood pressure medications can cause damage to the intestine that mimics celiac disease. 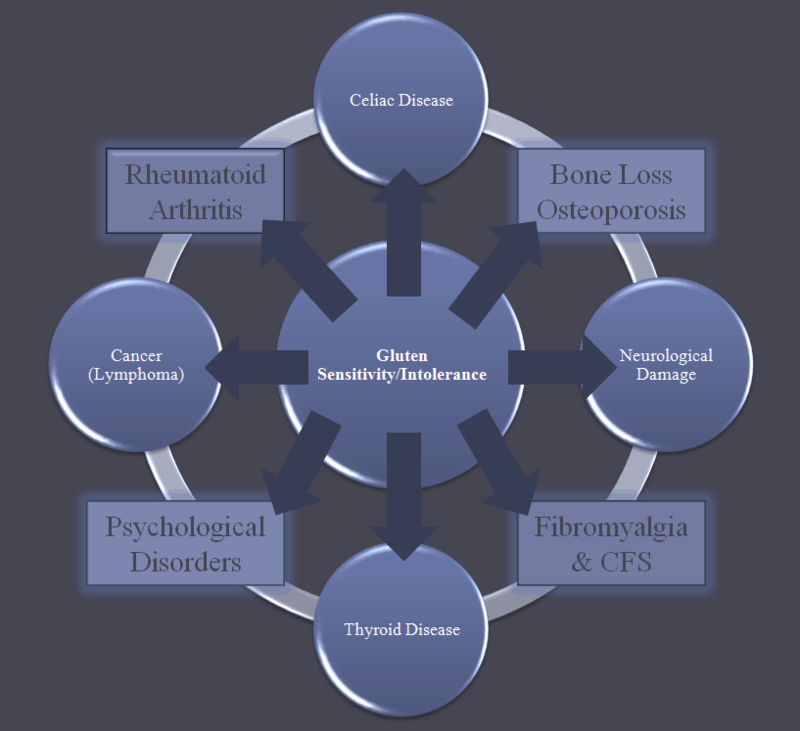 Additionally, soy, dairy, and corn proteins have all been shown to cause villous atrophy identical to that found in celiac disease. To date, no lab exists that is capable of measuring all of the different types of immune responses to all the different types of gluten proteins. Many will argue that an elimination diet is the best way to determine gluten sensitivity. I don’t fully agree with this premise. Yes, it is a smart thing to pay attention to the food you eat and how it makes you feel. If you feel bad eating a food, the common sense thing to do is to avoid it. However; many people suffer from silent, internal inflammation for years before properly diagnosed. It can take several decades of inflammatory damage before a person starts to have open symptoms of disease. An elimination diet does not identify these people. Understanding that gluten sensitivity is not a disease, but rather a state of genetics, it makes better sense to default to genetic testing as the most accurate screening tool. To date we have discovered two gene patterns that are present in the majority of those who have celiac disease. These genes are referred to as the HLA-DQ genes (there is an alpha1 and a beta 1 gene). These genes are responsible for building a receptor on the surface of your immune cells. The job of this receptor is to help the immune system recognize good from bad. Having a gluten sensitive gene pattern directly increases the likelihood that your body will look at gluten as an enemy. The side effect of this response is inflammation. The more gluten exposure over time, the greater the inflammatory response. 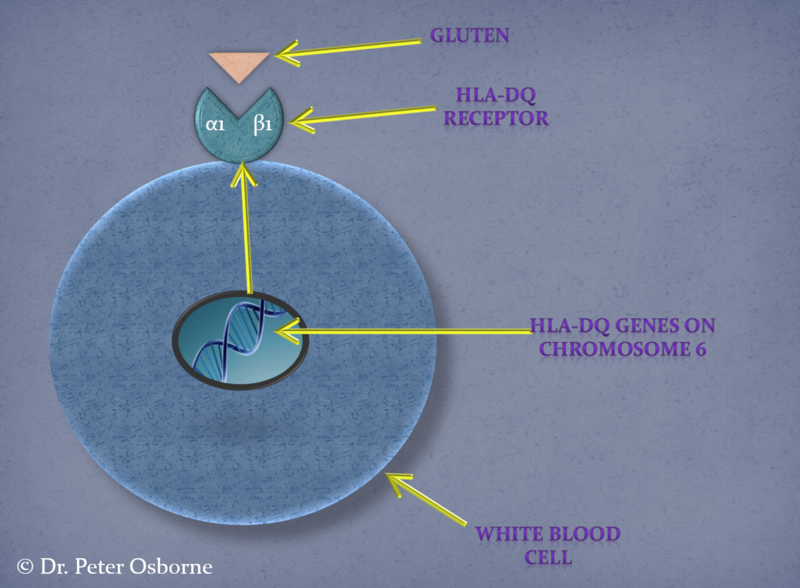 As stated above, there are thousands of different types of gluten proteins that have the potential to interact with the HLA-DQ receptors on your immune cells. Knowing your gluten gene pattern is helpful in determining whether or not gluten consumption poses a risk of creating inflammation. Not knowing is guessing. Thank you to Dr. Peter Osborne for allowing us to reproduce this amazing article. Learn more about Dr. Osborne and The Gluten Free Society. Next post Video - Do You Have Food Sensitivity? Previous post VIDEO - Is what you eat linked to your Hormone Imbalance?